Edward Feser, Ph.D., is Associate Professor of Philosophy at Pasadena City College in Pasadena, California. Called by National Review"one of the best contemporary writers on philosophy," he is the author of The Last Superstition: A Refutation of the New Atheism, Aquinas, Scholastic Metaphysics, By Man Shall His Blood Be Shed, and many other books and articles. You can checkout his blog here. 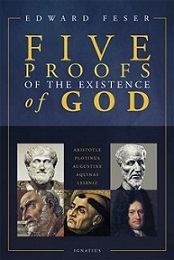 Five Proofs of the Existence of God provides a detailed, updated exposition and defense of five of the historically most important (but in recent years largely neglected) philosophical proofs of God's existence: the Aristotelian proof, the Neo-Platonic proof, the Augustinian proof, the Thomistic proof, and the Rationalist proof. This book also offers a detailed treatment of each of the key divine attributes -- unity, simplicity, eternity, omnipotence, omniscience, perfect goodness, and so forth -- showing that they must be possessed by the God whose existence is demonstrated by the proofs. Finally, it answers at length all of the objections that have been leveled against these proofs. This book offers as ambitious and complete a defense of traditional natural theology as is currently in print. Its aim is to vindicate the view of the greatest philosophers of the past -- thinkers like Aristotle, Plotinus, Augustine, Aquinas, Leibniz, and many others -- that the existence of God can be established with certainty by way of purely rational arguments. It thereby serves as a refutation both of atheism and of the fideism which gives aid and comfort to atheism. Better be good for goodness sake?